The art business features with conspicuous regularity in some of the acclaimed literary fiction that has emanated from the United States over the past couple of years. Rachel Kushner’s The Flamethrowers (2013) told the tale of a young Nevadan woman’s journey into the heart of the New York art world. The protagonist in Ben Lerner’s 10:04 (2015), pays a visit to an Institute for Totalled Art, an exhibition dedicated to artworks damaged in transit — a none-too-subtle commentary on the fickleness of value and meaning in art, all the more pointed for appearing in a novel replete with reflexive, self-ironizing gestures. 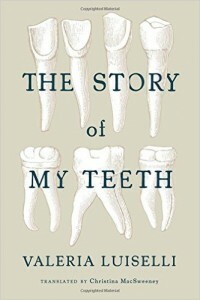 In a similar vein, the latest book by Valeria Luiselli, The Story of My Teeth, is a jovial little tale about an auctioneer who has sussed out the secret of success, that if you attach a good story to a piece of tat, people will pay good money for it. Again, the allegorical connotation hardly needs elucidating: This is a story not about teeth but about the process of cultural production, and the constructed and chimerical nature of narrative itself. There are already too many things . . . too many books, too many opinions. Anything I do will only add to the great pile of trash every person leaves behind. Am I making sense? He is. She is. But it does rather beg the question: At what point does this kind of thing (a) overreach satire into self-indulgent navel-gazing and (b) become boring and repetitious? The Story of My Teeth sets out to make you think about the nature of authorship and meaning, and it cannot but succeed in that modest aim. I daresay if I were to fall into the trap of remonstrating that it is not really a novel — but, rather, a sort of fabulatory jam session that has found its way, by some happy accident, to being printed and bound and distributed and displayed on the shelves of purveyors of fiction — I would be frittering energy on a moot quibble. It doesn’t, I suppose, really matter what we call it. Indeed, Luiselli is quite candid on this point. Where Lerner and Heti made fictions of their writer selves, Luiselli has taken things a stage further by actually crowdsourcing the composition of this work: An appendix to the The Story of My Teeth reveals that some of its vignettes had been written by Mexican factory workers who were invited to contribute to the novel. For this reason, and because the book also features a graphic timeline contributed by her translator, Christina MacSweeney, Luiselli calls this text a “collective ‘novel-essay.’” One is reminded of the dust jacket of the US edition of Tom McCarthy’s novel Satin Island, published earlier this year and similarly fixated on questions of authorship and narrative: The words “a manifesto,” “a confession,” “a report,” “a treatise” and “an essay” appear crossed out, before the artist settles on the subtitular “a novel,” in a playful allusion to the dubiousness of its taxonomic status. This is all good, clean, victimless fun. Here, though, is the trouble with in-jokes generally: They are pretty dull if you’re not in the gang and are not au fait with its argot. Has this book — and others like it — been written principally for other writers, or for the wider community of readers? (Besides which, there is the awkward question of Why. If you have something to say about fiction, non-fiction — i.e., literary criticism — remains by far the more congenial medium for communicating it.) Valeria Luiselli has written a smart, whimsical, and thought-provoking text-thing. But the wider current to which this book belongs probably cannot sustain many more publications of this type without incurring some sort of backlash. It appears increasingly to be an altogether rarefied pursuit, a kind of collective Creative Writing self-help bubble that threatens, with its eloquent narcissism, to bear out the gloomiest predictions of literature’s marginalization. Houman Barekat is a London-based writer and founding editor of Review 31. His writing has appeared in the Times Literary Supplement, the Spectator, Frieze, the Los Angeles Review of Books, and The New Inquiry.